Keep your treasures safe in our polyresin trinket box. 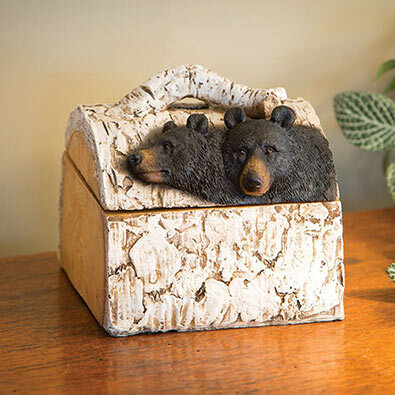 Crafted to resemble real textured birch bark with two majestic black bears featured on the top. A small branch handle completes the rustic look. Box opening measures 8cm x 8cm x 5cm. Box measures 9cm x 11cm x 11cm. A delightful surpirse on a tree or fence, our funny old man seems to emerge from the bark or wood with watchful eyes. Comes with four pieces, measuring approx. 20cm x 25cm when spaced to your liking. Looks best when the tree is at least 20cm wide. Made of durable polyresin. Includes keyhole on the reverse of each piece to hang on your screws or nails. A perfect house warming or garden gift!